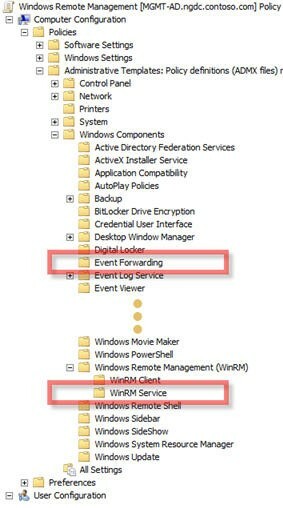 One of the least known yet most powerful management features to ship with Windows Vista and Windows Server 2008 is built‐in Event Forwarding which enables large scale health and state monitoring of a Windows environment ﴾assuming health and state can be determined from Windows Events ‐which they usually can﴿. Not only is this feature built into the latest versions of Windows, but it’s also available for down‐level OSs like Windows XP SP2+ and Windows Server 2003 SP1+ ﴾here﴿. Note: True enterprise class Windows eventing is included with enterprise monitoring solutions like System Center Operations Manager. Standards Based: No really! It leverages the DMTF WS‐Eventing standard which allows it to interoperate with other WS‐Man implementations ﴾see OpenWSMAN at SourceForge﴿. In the Windows Event Forwarding architecture, the subscription definition is held and maintained on the Collector in order to reduce the number of touch‐points in case a subscription needs to be created or modified. 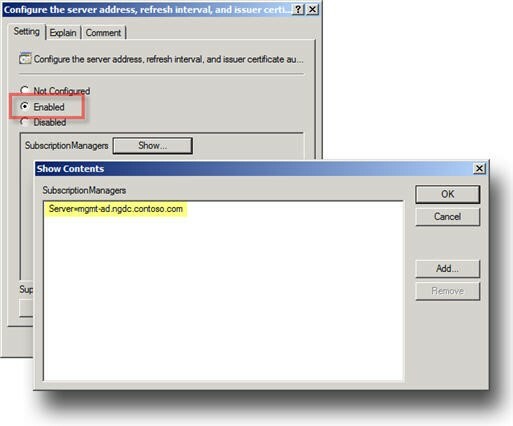 Creating the subscription is accomplished through the new Event Viewer user interface by selecting the ‘Create Subscription’ action when the ‘Subscriptions’ branch is highlighted. The Subscription may also be created via the “WECUTIL” command‐line utility. 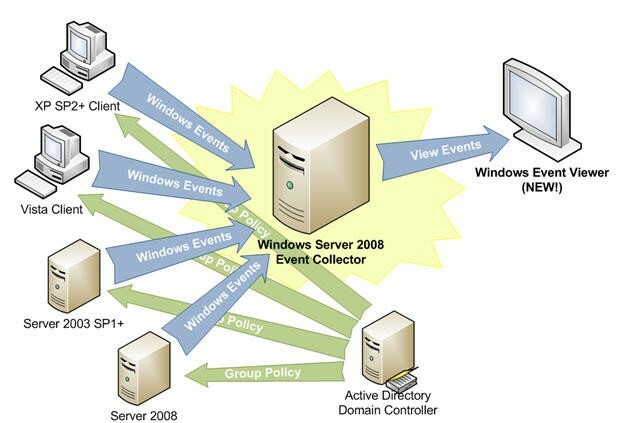 Note: Both Windows Vista and Windows Server 2008 can be event collectors ﴾this feature is not supported for down‐level﴿. Although there are no built‐in limitations when Vista is a collector, Server 2008 will scale much better in high volume scenarios. 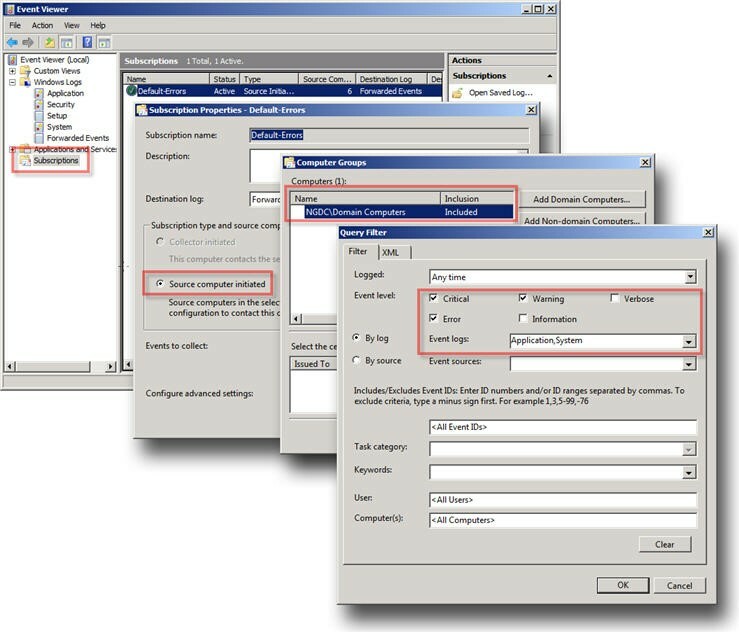 Although the above subscription is configured to leverage Group Policy, the subscription can be configured in a stand‐alone mode ﴾see the “Collector Initiated” option﴿. In addition, this subscription is designed to gather all events from the “Application” and “System” logs that have a level of “Critical”, “Error”, or “Warning”. This event scope can be expanded to gather all events from these logs or even add additional logs ﴾like the “Security” log﴿. Lastly, the subscription is configured to forward events as quickly as possible with the advanced settings delivery option of “Minimize Latency”. The default setting of “Normal” would only forward events every 15 minutes ﴾which may be more desirable depending the the Collector and Source Computer resources﴿. If Group Policy is not being used, configure the “Subscription type” to be “Collector Initiated”. In this case Source Computers will need to be manually added to the Subscription either through the Subscription configuration or the “WECUTIL” command‐line utility ﴾which can also be scripted using PowerShell, but that’s another topic﴿. Note: In cases where there Source Computer is generating a large volume of forwarded events ﴾e.g. 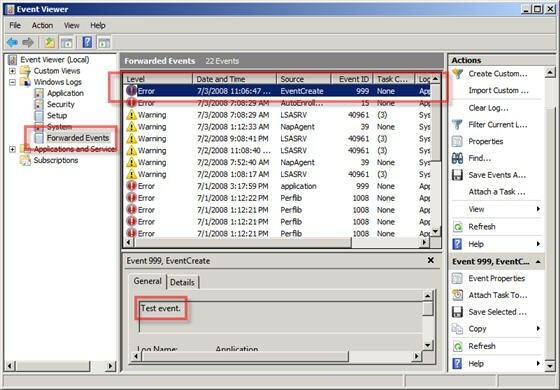 Security events from a Domain Controller﴿, use WECUTIL on the collector to disable event rendering Quick and Dirty Large Scale Eventing for Windows Otto for the subscription. The task of pre‐rendering an event on the source computer can be CPU intensive for a large number of events. The following GP setting will enable WinRM on the client as well as configure a Listener that will accept packets from ANY source. 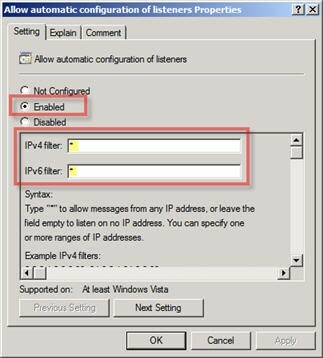 Note: This Listener configuration should only be used in a trusted network environment. If the environment is not trusted ﴾like the Internet﴿, then configure only specific IP Addresses or ranges in the IPv4 and IPv6 filters. As with WinRM, Group Policy can be used to configure Source Computers ﴾Clients﴿ to forward events to a collector ﴾or set of collectors﴿. The policy is very simple. It merely tells the Source Computer to contact a specific FQDN ﴾Fully Qualified Domain Name﴿ or IP Address and request subscription specifics. All of the other subscription details are held on the Collector. If Group Policy is not being used, then there is nothing to do here as the “Collector Initiated” Subscription will proactively reach out to the Source Computer. eventcreate /id 999 /t error /l application /d "Test event." Troubleshooting Step 1: Has Policy Been Applied to the Source Computer? Troubleshooting Step 2: Can the Collector Reach The Source Computer via WinRM? Troubleshooting Step 3: Is the Collector Using the Right Credentials? Note: These are the credentials defined in the Subscription on the Collector. The credentials don’t need to be in the local Administrators group on the Source Computer, they just need to be in the “Event Log Readers” group on the Source Computer ﴾local Administrators will also work﴿. Troubleshooting Step 4: Has the Source Computer Registered with the Collector? This will list all the registered Source Computers ﴾note if the Subscription is “Collector Initiated” then this will list all configured Source Computers﴿, their state ﴾from the Collector’s perspective﴿, and their last heartbeat time.